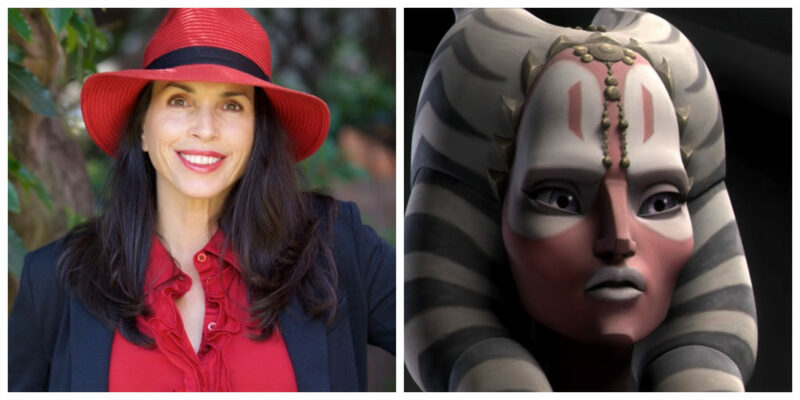 Tasia Valenza was the voice of Shaak Tii in The Clone Wars. Tasia has been working as an actress since the 1980’s and she was kind enough to answer a few questions for this 365 Days of Star Wars Women interview. What was your introduction to Star Wars? Do you have a favorite film or character? I remember my first introduction to Star Wars because my father would take me to movies every weekend. This was different from any other movie I had seen. From the first credits with the flying words in space I was magically transported to this other worldly land. I was hooked from the very beginning to the very end. If I were to say I have a favorite film it would probably be that first one. There was something so magical about it. It had the right combination of everything from Princess Leia, who I admired tremendously, and Han Solo the handsome, chivalrous, snarky guy, and the banter – I just loved it all. And Darth Vader! It was the most quintessential combination of every quality you could want in a film from the romance and the humor to the adventure and Luke Skywalker and learning what a Jedi was, who knew? It was mind-blowing. Madly in love with the movie. One of your first acting roles was on All My Children in the 1980’s. Any fun memories from those years? I was really excited to be on All My Children because I had actually watched the show for six months before I was on it because it was Luke and Laura time, General Hospital, it was a huge time for soaps. To be a 16-year-old, getting a job like that, it was more than mind-blowing. The cool thing about being on a soap was it was like being in a play every day. You basically had to learn a full script every morning and film it by the end of the day. It was a great opportunity to learn on the job as an actor because I did not have much formal training. So to be able to do a play a day definitely made me a sharper actor with the ability to jump on a dime and even learn a bit of improv since you could play around with the lines a bit as long as you gave the right cue line. I also cry pretty well and was nominated for an Emmy because I kept crying over my love being rejected by Tad Martin, who was “Tad the cad” so that was pretty cool too. My mother and father were responsible for basically starting and helping me become the actor that I am today. My father was my first acting teacher. He was an actor and was on Broadway at 15. He unfortunately did not stay an actor and became a restaurateur, but he was my first true acting teacher. My mom was a great actress and singer. She always took me to do extra work which was really funny because I was on The Doctors which was another soap at the time as an extra before I was on All My Children. I really owe both my parents a great deal of gratitude for teaching me and supporting me throughout my whole career as an actress and voiceover artist. What was your first voice acting role and what inspired you to pursue these types of roles? My mother really propelled me into voice-overs. Being a great mom she pestered me and cajoled me until I found my way. And it certainly was very different from what it’s like now to find coaches and teachers so it took me two years of studying till I got my first agent. The very first job I got was for Blockbuster Video and then I think one of my first video games was Leisure Suit Larry, which is hysterically cheesy. I remember playing Annette Boning on that one, so not the most illustrious start to my video game career, but certainly a fun one! I realized as I was doing more and more voice acting that I liked it overall better than on-camera acting because it was short, quick, and intense. I wasn’t limited by my physical type, my body, my face, my nationalities, all the things that constrain you as an actor. With voiceover, you’re only limited to what you can do with your voice which is really liberating for an actor. And still is! That’s why I’m so grateful to be able to do it. With voiceover it’s all about acting the part and as I like to say giving great voice. So I got more and more excited especially after I started to get some animated characters because then I was really acting and going back to my roots. I was getting to be able to do so much more than I was able to do in my on-camera life. 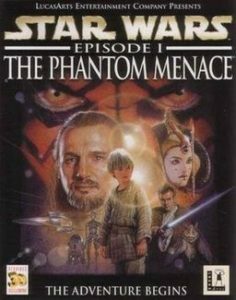 Is it correct your first role on a Star Wars production was in the 1999 video game The Phantom Menace where you voiced several characters including Ana Gella and a female Gungan? Did you audition specifically for one of these roles or did you know you were going to do several roles from the beginning on this project? Yes, I was in The Phantom Menace and it was very cool to be part of the Star Wars franchise at that time. I did specifically audition for Ana Gella because at that time you auditioned for a specific part and then you got it. Then when you got into the studio they would see if there were other parts that you were good for especially if were small – so that was fun to be able to do multiple roles. Can you go into some similarities and differences between working as a voice actor on a TV series versus a video game? Do you prefer one medium over the other or do you enjoy going back and forth between the two? The main difference between working on an animated series such as The Clone Wars versus a video game – most of the games I have done I have acted alone. You go to the studio and you do all your lines. You might be lucky to get the information of what’s happening in the scene and of course the director is very helpful and gives you context of the scenes , but when you’re doing a series you’re generally with at least a handful of other actors to play off of. And of course I love that because part of what makes you a better actor is your response and reactivity to who you’re working with. So, even though I love doing video games I prefer doing TV series where I get to act and become more immersed in the scene and the characters because you’re acting basically in a play. It’s an incredible blessing as an actor when you’re surrounded by other great actors and get to play off them. 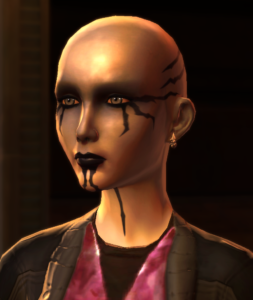 Kaliyo Djannis in Star Wars: The Old Republic. Yes, it’s always fun to be a villainess, the villain that you love to hate that have all of these extra fun dimensions to them. And of course I love playing strong female characters overall, but it’s nice when there’s some duality to the role and you can jump into moments where they truly think they are doing what they are supposed to be doing. You know most villains don’t think that they’re bad, they think they’re righteous and so that’s always fun to play. I try to be true to the character but not study what another actor did because I want to bring my own abilities to the character and not try to recreate it because each actor brings their own unique talents to it. So I do enjoy playing original characters like Kaliyo because now I’m the one creating it and someone else has to try not to be me :)! She’s a perfect example of duality where she’s this feisty, very hardline female who has a lot of Han Solo qualities, just kind of under her breath saying something rather sardonic, and yet she’s quite heroic in her own right. I channeled Linda Ferrantino from a great movie called The Last Seduction. If you haven’t seen this movie it’s a great one to see because she’s dark, funny, and feisty so Kaliyo was definitely an homage to her. Do you have any favorite video games you have worked on? Did you have any idea when you were working on Batman: Arkham Asylum voicing Poison Ivy that the game was going to be so popular and lead to so many other Batman games? Hard to pick a favorite with video games but I do have a few very close to my heart. Some of them are very meaningful to the fans which of course touches me. Poison Ivy is, of course, one of the main ones because I feel so connected to her. I’ve been blessed enough to continue to go on to do more than the Arkham games to play her so I feel that people have identified me with her. That makes me feel so honored because there are so many great actresses who have played Poison Ivy. So she’s definitely one of my favorites. She has a great arc in the Arkham games and no, I had no idea it would be so popular. Recently I’ve also had the chance to resurrect, literally, my character Sniper Wolf from a very early game called Metal Gear Solid that’s having kind of a resurgence in the fandom world because it’s being made into a movie. Do you think the work you did in Star Wars video games helped or led to in any way you getting the role of Shaak Tii in The Clone Wars TV series or were those experiences completely separate? How would you describe Shaak Tii as a character? I think that my getting Shaak Ti was pretty separate from the previous work that I did. I was so delighted to be chosen to be such a cool character, a Jedi above all, which really thrilled me as I will never be that cool – but it’s fun to play someone like that. Shaak Ti is both confident, strong, and has a detached empathy, as someone described her recently. She’s wise, she’s humble, she’s powerful. I truly admire her and that’s always fun to play someone you admire. By playing her she informs me and makes me a better person so that’s super cool. Do you have a favorite episode you worked on for The Clone Wars? Or perhaps a favorite line? I do love “You can protest all you want. My word is final.” Very simple. Very to the point. Very confident. Do you have a dream character you’d like to voice or play in a Star Wars film, TV show, or video game? Oh, I’d love to have a crack at Princess Leia. She’s such a tough cookie and yet feminine at the same time. I could never fill Carrie’s shoes but it certainly would be fun to play that kind of character. I love strong women and she’s the strongest princess I’ve ever heard of. Recently you have been the voice of the USS Shenzhou computer on Star Trek Discovery. Were you a fan of Star Trek before you worked on this series? I’ve always been a fan of Star Trek. I grew up with it on the TV. I actually have a bit of a history with Star Trek because I was the first adult Vulcan T’Shanik in Star Trek: The Next Generation. 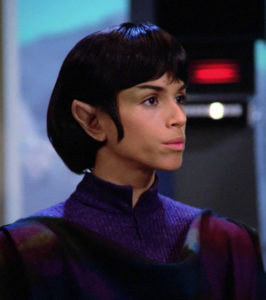 I loved putting on the ears, the wig and felt like I was really the spawn of Leonard Nimoy. I definitely had a similar look with the eyebrows – they didn’t have to do much with my eyebrows besides put a little makeup on them! So that was very fun. I was also on a show called Space: Above and Beyond that also has a wonderful history and great pedigree, great actors. So for some reason I’m meant to be in space and I love it. It’s a way for me to become otherworldly when I’m connected very much to being on the ground here in my life. Being a soccer mom which is the quintessential (to me) grounded role, I’m a mother of three, so it’s a wonderful gift when you can escape to play these wonderfully supernatural characters in other worlds. Can you share anything about upcoming projects you’re working on? I’ve been blessed enough to be collaborating on what I consider to be a passion project, which mostly means I’ve made no money on it LOL! But it’s a wonderful app called Haven Affirmations. I co-wrote all of these masteries with a friend of mine and voiced them. I call it a ‘be kind to your mind’ app. They are guided meditations broken down into seven-day masteries in subjects like confidence, health, wealth etc..and the twist with this is one is repeating affirmations. I think affirming ourselves is definitely a part of how I’ve had a successful life, and setting intentions, and speaking to myself positively. All my role models I’ve admired and modeled have helped me to make that my mindset and it’s certainly helped me to achieve my life goals and continues to. To be able to “Give Great Voice” to the wisdom that I’ve been taught and to share them through this app to reach as many thousands of people as I can is a tremendous gift to me so I’d love to get the word out for that. I’ve also launched a platform called “Giving Great Voice” which is taking a lot of what I’ve learned as an actress and voice-over actor and voiceover coach, and teaching these skills to non-actors to think like a voice actor in our own lives so we can play our professional and personal roles more effectively. You can find Tasia Valenza on Twitter here. Tasia’s voiceover website is http://tasiavalenza.com. You can find out more about Giving Great Voice here and you can download the app Haven Affirmations here.